A new trend seems to be popping up across North America where employers, including several Canadian jobs posted on indeed.com, are refusing to hire smokers. “Everyone knows smoking kills you and we prefer to work with very intelligent people who aren’t choosing to kill themselves with every puff,” Rob Hall, Momentous Corp’s president told CTV news in an interview last week. Hall stated that by refusing to hire smokers, it has slashed half the cost of employee health benefits compared to five or six years ago. A recent study conducted by the University of Nottingham showed that smokers are 33 per cent more likely to miss work, taking an average of 2.74 more sick days than non-smokers. It has been estimated by the Conference Board of Canada that, on average, an employee who smokes costs employers $3,396 a year, as reported by Health Canada in 2008. These costs are associated with increased absenteeism, lower productivity, unscheduled smoke breaks, maintenance of smoking areas, property damage and health and fire insurance costs. The study also shows that smoke-free environments increased productivity, increased morale, lowered cleaning costs and lessened exposure to secondhand smoke for all non-smoking employees. 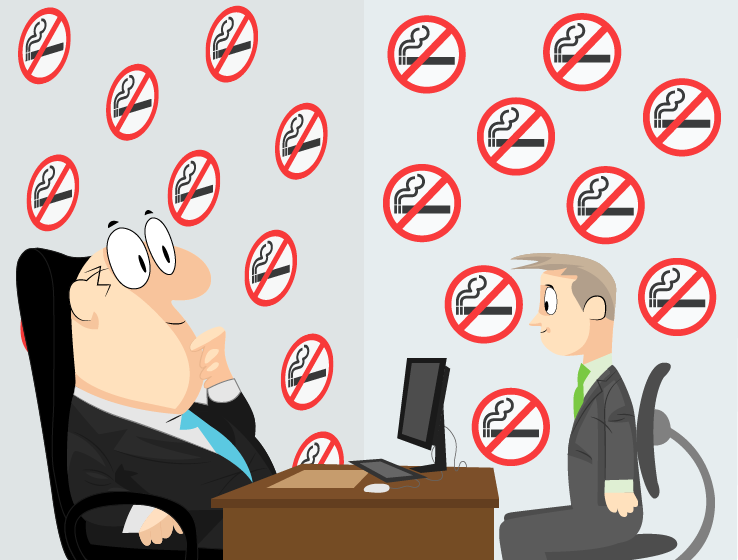 With these factors, many employers have introduced policies that restrict smoking in the workplace, limited certain types of jobs to non-smoking employees and offered programs designed to encourage and assist employees quit smoking. From experience, I see that smokers generally take more breaks. From the five jobs I’ve worked, two of them were in restaurants—and if you’ve ever worked in a restaurant, you’d know that in most cases you can’t have a lunch break. However, smokers are allowed to step outside sometimes five or more times in a day, depending on the boss’s restrictions. I would work like everyone else, a seven or eight hour shift, not having one single break and it would frustrate me more than anything being almost the only one working for those straight hours while almost all the workers would have the luxury of stepping out and taking their time with their cigarette. Companies have the right to hire who they want as long as it doesn’t discriminate under the Charter of Rights and Freedoms. Although it does come down to a personal choice of lifestyle, smoking is not who you are; it’s a choice you made that does have negative consequences. Instead of defending smoking, maybe smokers should take this as even further motivation to quit. Do you smoke? You better think twice. Actually, more than twice or you might have trouble finding a job. According to a recently published article on CTV, a growing number of private companies in Canada, as well as in the U.S. and abroad have begun to include the “non-smokers only” requirement when looking for new employees. When I saw this article for the first time, I thought it was a joke; it’s ridiculously unfair to include the non-smoking status as a prerequisite for a job. I figured this was a discriminatory condition. Still, I decided to compare my thoughts with some official sources, mainly the Canada Labour Code. Labour Standards in Quebec also allow for a coffee break, which is, “not obligatory, but when it is granted by the employer it must be paid and be included in the calculation of the hours worked”. By law, during a working day we are allowed a minimum of 30 minutes for a lunch break, which is not paid. We also have a “coffee break”, which is defined by the employer when it comes to duration, but is paid. Let’s be frank; during a full day shift, we don’t work each and every second. We take the time to talk to our colleagues, our bosses, get our coffee and so on. So, you see, it’s not just the act of smoking that determines the quality and productivity of one’s employees. Smoking is not the only time-spending habit that is worth consideration. This isn’t to say that smoking doesn’t decrease productivity. According to the Public Health Agency of Canada, most smokers are addicts. This means that an employee-smoker wouldn’t smoke his “morning-cigarette” and “lunchtime” cigarette (like you do with your coffee). In most of the times the smoker would need a puff each one to two hours. What’s funnier, the smokers usually don’t like to smoke alone; they need a companion, a partner that shares the same habit, so don’t be surprised when you see that they are going in couples. The time spent by an employee enjoying his or her cigarette may vary from insignificant to substantial. I don’t try to cover this counterargument, however, I don’t believe productivity is the issue that most people have against hiring smokers. I think that the antismoking attitudes in our society and the promotion of a healthy lifestyle are reinventing themselves. Since the 1950s we’ve heard about legal trials lost by big tobacco producers based on the insufficient advertising of the negative effects on the population’s health. We speak about the risks of smoking everywhere, however, according to the 2010 Canadian Tobacco Use Monitoring Survey, 17 per cent of Canadians aged 15 years and older are smoking. Smoking may not be good for you, but ultimately it’s not fair to favour job applicants who make different lifestyle choices. We are entitled to certain breaks and how employees spend them shouldn’t be controlled.